When you cut and burn a tropical forest, you’re left with a barren plain of cracked red mud, incapable of supporting life – the opposite of the teeming, hyperdiverse array of life that was destroyed. Once the trees are gone, the nutrients wash away and the soil degrades into a dense, brick-like layer so hardened that plant roots can’t get through it. This was the vision of tropical deforestation held in the popular imagination for many years, but the reality is more complex – and more hopeful. In recent decades, researchers have found that tropical forests are remarkably resilient. As long as some remnants are left when the forest is cleared to provide seeds and refuges for seed dispersers, tropical forests can grow back with astonishing speed. In a paper published this week in Nature, lead author Lourens Poorter and a team of international collaborators, including me, found that forests in Central and South America can quickly rebound without human intervention on land that has been cleared for cattle grazing or growing crops. This finding has important implications for climate change because these so-called secondary forests soak up large amounts of carbon from the atmosphere, even without costly reforestation efforts. These regenerating forests are also crucial for protecting biodiversity and all the ecological and social benefits it provides. 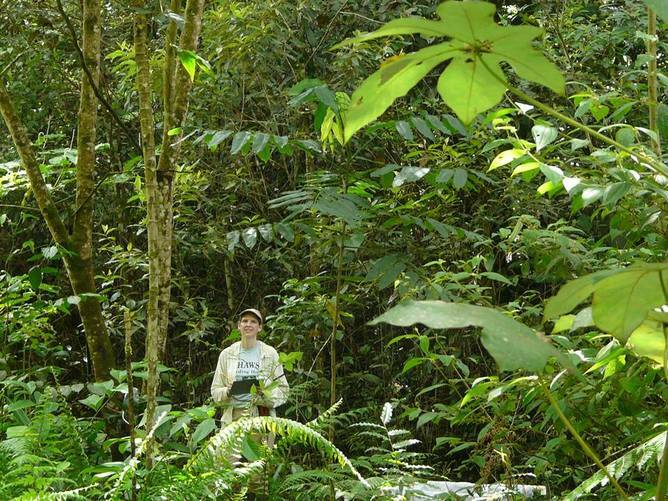 Dr. Letcher in a 15-year-old secondary forest in Costa Rica. Tropical secondary forests – that is, forests that grow after a major clearing, such as a fire, farming or logging – cover an increasing part of the globe. And as their extent expands, so does their potential to shape conservation strategies, both at the local and global scales. At the U.N. Climate Summit in 2014, 30 nations and a host of NGOs and private companies endorsed the New York Declaration on Forests, a document that advocates halving deforestation by 2020 and ending it completely by 2030. One of the key points of the declaration calls for the restoration of 150 million hectares (about 375 million acres) of degraded forest land by 2020 and additional restoration in the following decade. But active forest restoration can be an expensive process, and it may not be cost-effective or even necessary in every case. In landscapes with low levels of degradation, simply protecting young forests and allowing them to develop may be the best strategy. In our research, my colleagues and I present the largest data set yet assembled to investigate forest regrowth in the New World tropics. The data set spans 45 sites in the lowland tropics from wet forest to dry forest, with a total of 1,478 plots and more than 168,000 individual trees. It offers an unprecedented, and more hopeful, view of forest recovery. According to this analysis, tropical secondary forests have enormous potential for removing carbon from the atmosphere. The net carbon uptake for these secondary forests is 11 times that of old-growth forests in the region we studied. 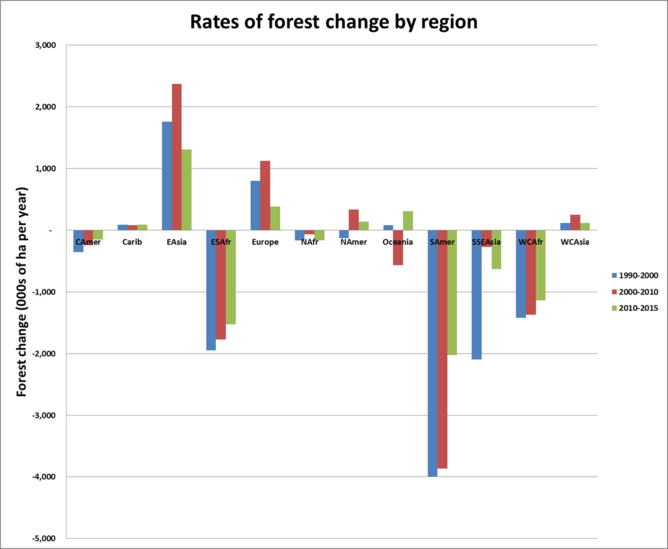 The rate of biomass recovery varies widely across the region, with the fastest regrowth in areas with high rainfall. The median time for a forest to reach 90 percent of old-growth biomass levels was 66 years, but recovery can be much faster in some areas. 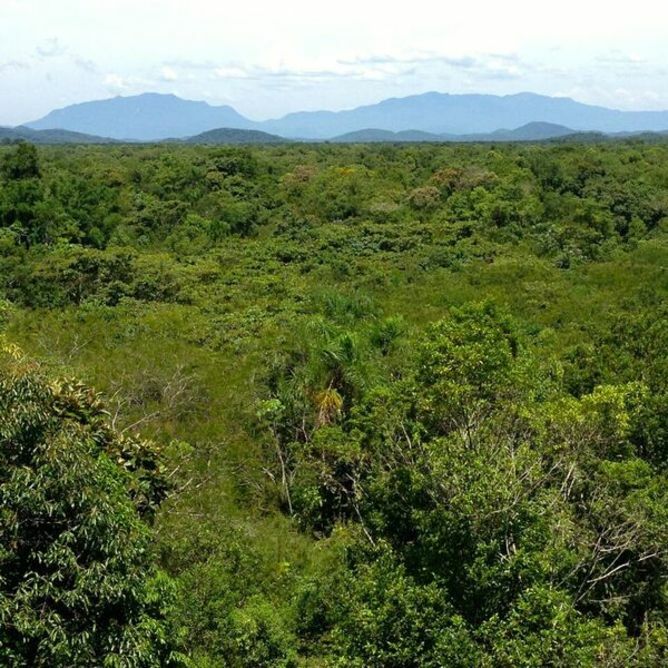 It shouldn’t come as a surprise that tropical forests can grow back after major disturbances. Tropical forests can be affected by a number of different large-scale natural disasters like floods, fires, landslides, major storms and volcanic eruptions. Even old-growth tropical forests are highly dynamic systems, marked by cycles of tree death and regrowth. The mortality rates for trees larger than 10 centimeters in diameter have been estimated at one percent to two percent per year for forests in the Amazon and Central America. In other words, at the upper end, one in every 50 large trees will fall in the course of a given year. The gaps in the forest that result from treefalls are rapidly colonized by a riot of vines and fast-growing tree saplings. The heterogeneity of habitats produced by this cycle is a major driver of tropical diversity. In an old-growth forest, vegetation quickly grows in to fill the gaps left by fallen trees. In addition, the history of human-induced disturbances in tropical forests is longer and more complex than we often acknowledge. Legacies of ancient human use, stretching back for millennia, have been detected in nearly every “pristine” tropical forest on earth: massive earthworks in the Amazon and modern-day Cambodia; charcoal and pottery fragments in the Congo Basin; and evidence of forest clearing going back nearly 50,000 years in Papua New Guinea. Indeed, various forms of slash-and-burn cultivation have been practiced for millennia throughout the tropics. As long as the cleared areas are modest in size and the period between cycles of cultivation is sufficient for recovery, diverse forests can persist for thousands of years. Tropical secondary forests can – and should – form a substantive part of the long-term global strategy to combat carbon emissions and preserve biodiversity for the future. Our recent research shows, for example, that in areas where biomass recovery is slow – like the tropical dry forest – we should prevent further forest loss. Where recovery is rapid, we can combine old-growth forest conservation with policies that promote secondary forest formation. Shifting focus to the conservation of regenerating forests should not take away from the urgent imperative to conserve the remaining uncut tropical forest. The clearing of old-growth tropical forests is a major source of human-induced greenhouse gas emissions, second only to fossil fuel combustion. Clearly, keeping the carbon that’s currently stored in intact tropical forests from being released to the atmosphere should be a priority. Old-growth tropical forests also harbor immense biological diversity – including genetic diversity – and if all of the remaining old-growth forests in a landscape are cut, there will be no seed source to promote regeneration. Conserving secondary forests offers a different, and complementary, set of benefits. As well as their massive potential for taking up carbon as they grow, secondary forests provide resources and livelihoods for the people who inhabit them. Secondary forests can harbor a high diversity of ethnobotanically important species that can be used for medicines. They can serve as extractive reserves, where limited harvesting of timber, game animals and other forest products will prevent the exploitation of resources in vulnerable protected areas. They protect watersheds and prevent erosion. Natural forest regeneration in Paraná, Brazil. As secondary forests grow back, they eventually come to resemble the forest that was cut, and in the meantime, they knit together the remaining fragments of forest into a more contiguous landscape. As David Quammen wrote in “Song of the Dodo (1997),” isolated populations of organisms in forests lose connections to the resource base that supports them. Over generations they lose their genetic diversity, making them more vulnerable to inbreeding, disease, and eventual extinction. Secondary forests offer the hope of reconnecting habitats and creating a more resilient landscape for the future. So harnessing the power of forest regeneration in the tropics will have benefits both locally – providing resources and restoring ecosystem services – and globally, by sequestering carbon from the atmosphere. At the Paris Climate Summit, leaders took important steps toward halting deforestation. Promoting forest regrowth is another vital piece of the equation. It’s time for policymakers to recognize the benefits that tropical secondary forests provide, and to shape policies that take advantage of this enormous potential. Forest loss has halved over the past 30 years according to the 2015 Global Forest Resources Assessment released yesterday. Between 1990 and 2015, global forest area declined by 3%, but the rate of loss has halved between the 1990s and the past five years. Most of this loss occurs in the tropics. Forests are a big deal. They provide us with clean water, they sequester and store carbon, they provide timber and non-timber forest products, and are vital to the everyday survival of many of the world’s poorest people, who live in and around forests. They also provide valuable habitat for animal and plants species. For example, tropical forests, while covering only 15% of the global land area, contain over 50% of land animals and plants. The area of land covered by forest and trees is therefore an important indicator of global environmental condition. Every five years, the Food and Agriculture Organisation of the United Nations produces results from its Global Forest Resources Assessment. This assessment involves a major survey of all countries using a common reporting framework, agreed definitions and reporting standards to provide statistics on forest area and related data on forest condition and use. The assessment is the most comprehensive global picture of forests. The data collection involves hundreds of scientists and technical experts from across the world. The 2015 results were released this week at the World Forestry Congress in Durban, South Africa. With a team of co-authors over the past year, I have worked with the Food and Agriculture Organisation to analyse data on forest area and area change, comparing climatic domains (tropical, sub-tropical, temperate and boreal), geographical regions and country income categories. This study has recently been published. Our results showed that total forest area declined by 3% between 1990 and 2015, from 4,128 million hectares to 3,999 million ha. The good news is that the annual rate of net forest loss halved from 7.3 million ha per year in the 1990s to 3.3 million ha per year between 2010 and 2015. Natural forest loss between 1990 and 2015 was higher, declining by 6%, from 3,961 million ha to 3,721 million ha, while planted forest (including rubber plantations) increased from 168 million ha to 278 million ha. 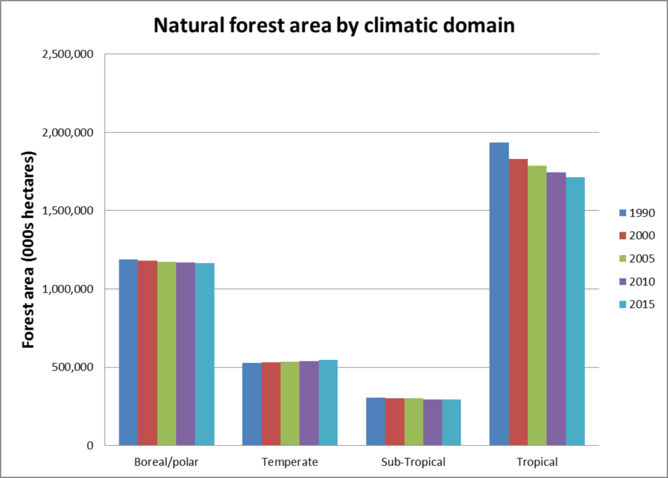 There was a significant difference in net forest loss between climatic domains, with most deforestation occurring in the tropics. From 2010 to 2015, tropical forest area declined by 5.5 million ha per year while temperate forest area expanded at a rate of 2.2 million ha per year. Boreal and subtropical forest areas showed little net change. Forest area declined in Central and South America, in South and Southeast Asia and all three regions in Africa. Forests expanded in Europe, North America, the Caribbean, East Asia and Western-Central Asia. Brazil (984,000 ha per year), Indonesia (684,000 ha per year) and Nigeria (410,000 ha per year) had the largest net forest loss between 2010 and 2015. For Brazil and Indonesia, these rates of forest loss were significantly lower than in the 1990s. Countries reporting a large forest expansion from 2010 to 2015 included China (1.5 million ha per year), Chile (301,000 ha per year) and the USA (275,000 ha per year). The assessment does not provide data on the drivers of forest loss. Other studies show that major drivers are large and small-scale agriculture, urban expansion and clearance for infrastructure, such as roads, mines and hydro-electric dams. We can see from our study that loss is occurring most rapidly in some of the poorest countries. The concept “forest transitions” has been identified in studies of forest change and economic development. Over the course of a country’s economic development the dynamics of forest area generally follows a U shape. 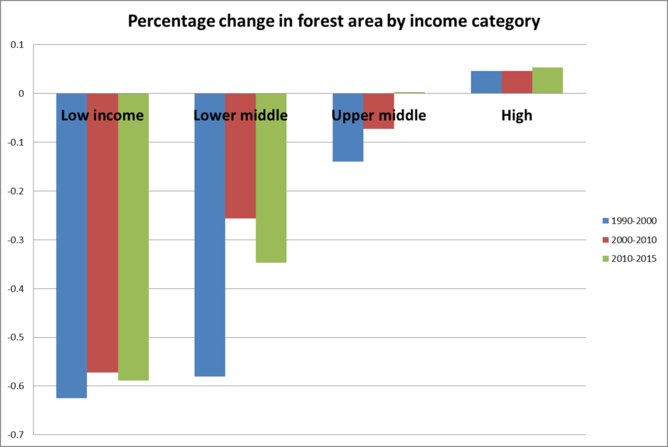 Poorer countries undergo significant forest loss then, as the economy develops, forest cover increases. Our analysis indicates that, between 1990 and 2015, 13 tropical countries may have either passed through their forest transitions from net forest loss to net forest expansion, or continued along the path of forest expansion that follows these transitions. These include India, Vietnam, Ghana, Laos and Costa Rica. The assessment differs from other global or tropical assessments that rely only on remotely sensed data to assess change in forest area. Remote sensing studies detect changes in tree cover, but do not discriminate between forest areas that are disturbed, for example by timber harvesting, fire or insect pests and will regenerate and remain forests, and areas of forest that are permanently converted to other land uses. Consequently, studies like the World Resources Institute’s Global Forest Watch report large areas of tree cover loss in places like Russia, Canada and the United States, while the Global Forest Resource Assessment reports either expansion or little change in forest area in these countries. Comparing the 2015 assessment data to these remote sensing surveys was therefore challenging, due to these different definitions of forest, differences in the assessment periods and in assessment methods. Overall, when similar definitions are applied (such as the threshold tree cover for vegetation to be considered forest) the findings of our 2015 assessment are consistent with these other studies. While most developed countries have had high-quality forest monitoring for some time, forest data from many developing countries has often been out of date or incomplete. Data quality is improving in many tropical developing countries with high forest cover, in part because of investment to support the implementation of the REDD+ mechanism under the UN Climate Change Convention. However, some countries, such as the Democratic Republic of Congo, Angola and Bolivia, are reporting significant forest areas but based on low-quality data. More investment in national and global forest monitoring is therefore needed to improve our understanding of forest dynamics. With a large forest area and a small population, Australia has also been challenged in forest monitoring. Our reported area of forest has varied between 164 million ha in 2003 and 125 million ha in 2013, with the reduced area primarily the results of better quality forest mapping in remote regions of northern Australia. Based on these new estimates, Australia reported that our forest area declined from 128.5 million ha in 1990 to 124.7 million ha in 2015, but with a net gain of 1.5 million ha between 2010 and 2015. The 2015 assessment also includes data on forest ecosystem condition and productivity, carbon stocks, sustainable forest management, designation for different uses and economic and social benefits of forests. As we move towards the UN climate change meeting in Paris and the agreement of a new set of Sustainable Development Goals, the value of forests in addressing climate change and other global and national development objectives is becoming more apparent.